Today I will show you terrible DSLR shots. It so happened that my first dinner outing after getting the new camera was at Astons Prime (just two days before Smok'inn Frogz). The restaurant with dark wood panels and tall black booth seats is indeed wonderfully cosy with dim incandescent lighting. But challenging for photography. It didn't help that mine was a busy, three-generation family entourage, involving near-military scale logistics, squirming noisy babies, one with itchy hands constantly grabbing at plates, waiters' sleeves, serving trays and hot food. But I did not want to miss capturing the food and occasion on camera. Astons is by now, almost a household name for cheap Western set meals. This "Prime" outlet is its high end foray into more premium offerings. Think of it attempting to bring Lawrie's or Morton's to the masses. There were quite a few negative reviews in its early days, which hinted at teething problems. But now they seem to have gotten their act together. Service that evening was genuine and pleasant. They served us iced and warm water, regularly topped up, and even extra napkins when they saw us needing it. 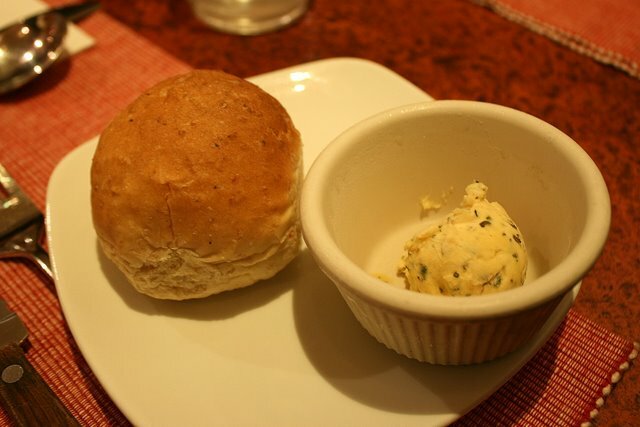 I liked the warm rustic dinner roll with garlic herb butter (unsalted, I think). A good start. The wild mushroom soup (S$5) was filled with chunky mushroom pieces and clumps of cream but tasted a tad sourish, which didn't do it for us. I detected the scent of evaporated milk too, another thing we didn't fancy. 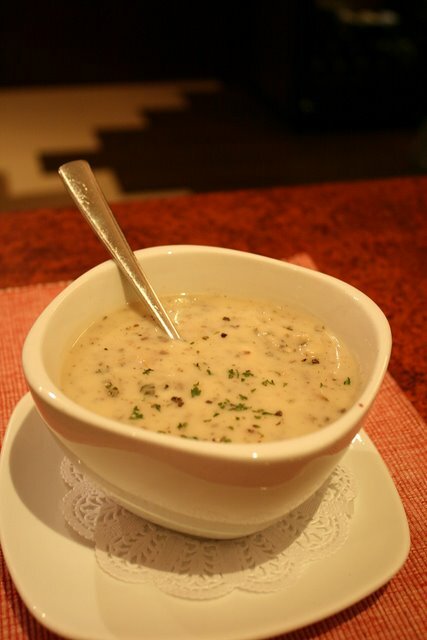 However the clam chowder (not pictured as it looks too similar) was much much better, for the same price. At S$5, we didn't complain. Even a fancy can of Campbell's costs more these days. 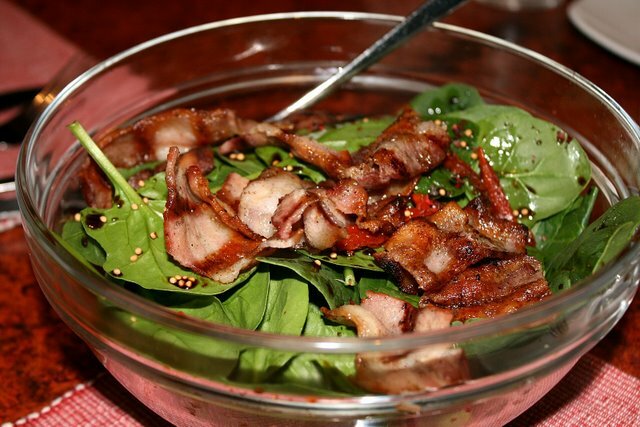 Delightful salad of raw spinach and crisp, grilled bacon. A very generous portion for S$12.90. I was delighted by the tangy dressing and mustard seeds which added unusual texture to the salad. I could just have this and be happy! This is one of the main reasons we came here. Mother-in-law had been craving crab cakes, so we decided to come here and try Astons' version. Apparently they sell out really fast, so we pre-ordered two when we called for reservations. There's only one patty per serving, and it looks like a "bergedil" (the Malay fried potato-and-mince patty). However, tastewise, it was a bit musty and bland. 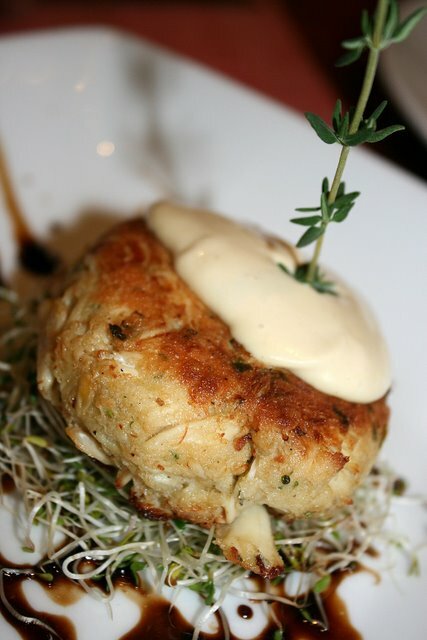 Even the grassy taste of the alfalfa sprouts overpowered the crab cake. Absolutely not worth the S$16.90 it commanded. 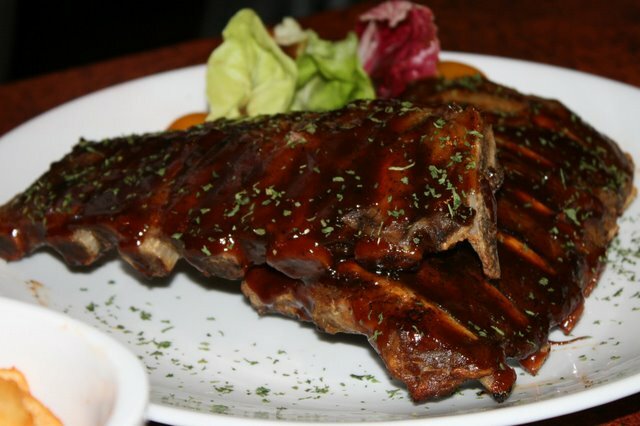 Aside from the steak, we also had USDA baby back ribs (S$26.90). Another enormous portion served on warmed plate. It was meaty but a wee bit dry. We almost had trouble finishing this. With the mains, you get to choose sides for S$3 each. 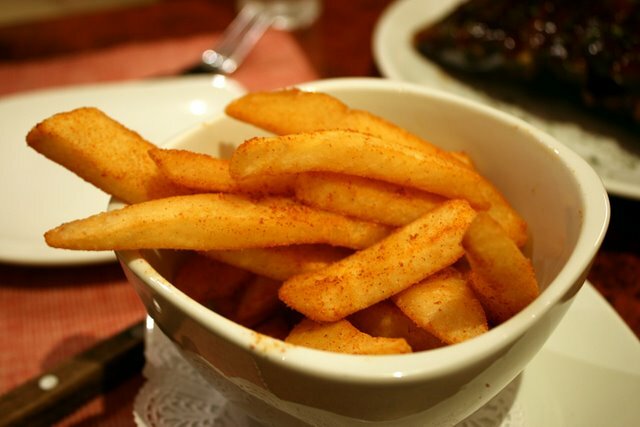 Oh the steakhouse fries (S$3 as side dish to main) are good, so very good. Lightly dusted with paprika and salt, they stayed hot and crispy for quite a long while. One final look at the steak again, which was really the star of the show. 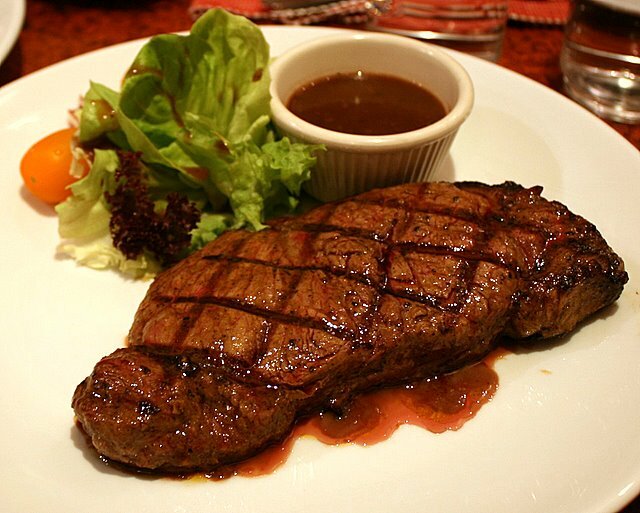 This premium slab of USDA Choice, New York 12oz striploin (S$38.90) here was HUUUGE. And more importantly, delicious. This is their definition of medium - just slightly pink in the middle but not bloody - although this itself was too "raw" for my mother-in-law and maid. While we've never had a good experience at Astons Specialties, I'd come back to Astons Prime for the steak, spinach salad and fries. Pleasant ambiance and good service round up a nice experience. On the whole, we did feel it was pretty good value-for-money. On top of that, there's no service charge or GST. This goes on my list of good places to indulge Neanderthal cravings. 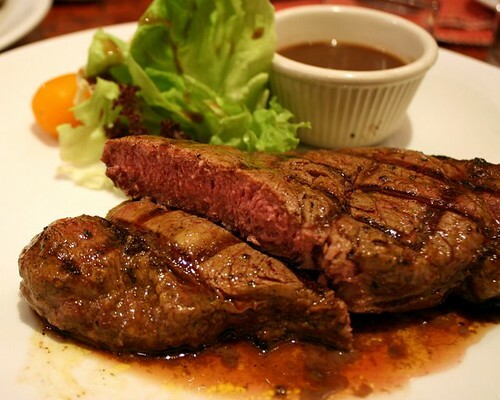 From the photo, the steak looks really huge!! CGM: Hello! Your first comment here! The good thing is Astons Prime accepts reservations unlike Astons Specialities! I think the crowd has died down for Astons Prime. Only half full when I went. I bought a Canon EOS 400D!